Eurocom launches the fully upgradeable, high performance 15.6” Tornado F5 with NVIDIA GeForce GTX 1080 graphics, Intel Core i7 7700K processor, 64 GB DDR4 memory via four slots, dual M.2 SSD slots and a 4K 15.6” display. EUROCOM Tornado F5 users who own an Intel Core i7-6700K SKU can upgrade to the i7-7700K since the two processors share the same LGA 1151 socket. 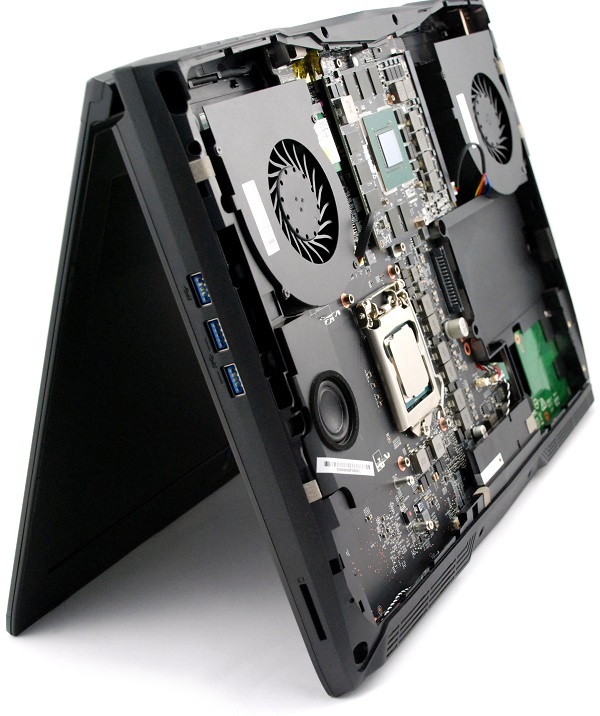 The EUROCOM Tornado F5 is one of the few laptops with a Z170 chipset, LGA 1151 CPU socket and MXM 3.0 graphics slot for a wide range of customization options. Two M.2 SSD PCIe x2/x4 or SATA SSD and one 9.5mm SATA3 6Gb/s storage drive is also supported to offer a great combination of capacity and speed. Four memory slots are available to support up to 64 GB of DDR4 SODIMM. Customers have a 15.6” FHD matte display and a 4K matte display to choose from as well. The internal components of the EUROCOM Tornado F5 are easily accessible to allow users the ability to upgrade chosen components to increase performance, capacity and life span. “Eurocom is pleased to be able to offer our customers a potent combination of NVIDIA GeForce GTX 1080 graphics and Intel Core i7 7700K processing performance in a 15.6” laptop” Mark Bialic, Eurocom President. Impressive benchmarks of the EUROCOM Tornado F5 can be found here. The EUROCOM Tornado F5 is equipped to take full advantage of the overclock-ability of the new kaby lake processors due to their high-quality copper heatsinks, high-speed fans and use of Innovation Cooling Diamond 24 carat diamond thermal compound to manage the temperature of the desktop processor. All Eurocom Mobile Supercomputers come with an Unlocked BIOS granting access to overclocking capabilities and other hidden settings only available to power users. Achieve unsurpassed performance by gaining control over the finest details of the CPU, memory, and GPU (Unlocked BIOS and VBIOS). Storage: up to 3 physical drives: 2x M.2 2280 PCIe x2/x4 or SATA SSD and 1x HDD/SSD (9.5mm) SATA3 6Gb/s; RAID 0/1 with 2x NVMe SSDs.